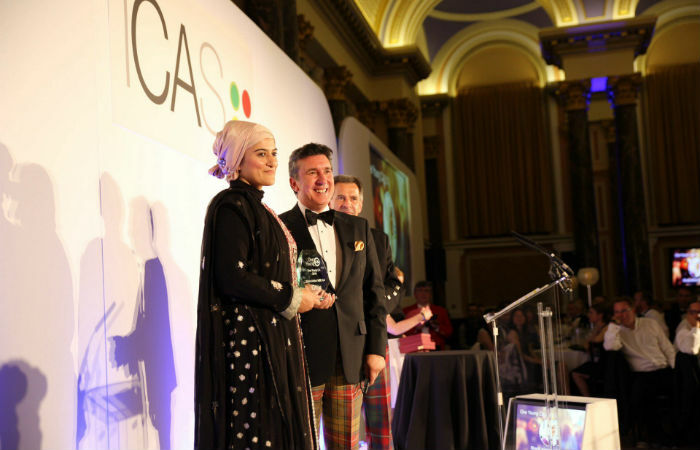 Rimla Akhtar MBE CA has been awarded the title of ICAS One Young CA 2016. Category winners were Joel Watt CA, Colin McLellan CA and Thomas Gillan CA. Two additional awards were announced for Mark Speirs CA and Rachel Singh Davies CA. 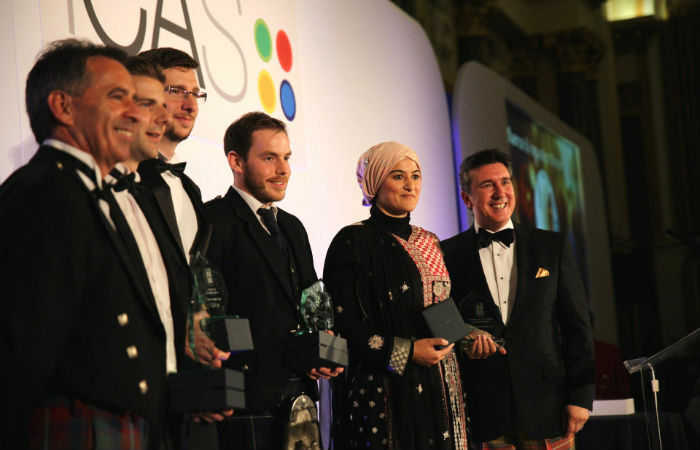 Rimla Akhtar MBE CA was announced as the winner of the 2016 ICAS One Young CA and 35 CAs under 35 awards, at the London CA Dinner last night. Rimla was distinguished from a pool of 35 exceptional finalists to be the best young CA representing ICAS and the chartered accountancy profession to the wider world. ICAS CEO Anton Colella presented the award at Gibson Hall on 7 September as part of the CA Dinner and 35 CAs under 35 Awards. He said: "Earlier this year, ICAS launched an exciting search to find the best and brightest young members in our profession. "The top 35 CAs under 35 list recognises the most outstanding young CAs who are leading and inspiring the next generation of ICAS. "Rimla is a fantastic example of all that is good in a young CA. She has powerful values, ambition, commitment and a will to serve our wider society." She said: "It has been an amazing evening, meeting all the shortlisted candidates, and to be selected as One Young CA from such a clearly talented group, is really humbling. "To be rewarded by ICAS is such an honour and I'm really looking forward to representing them at One Young World and beyond. As well as her success in the overall ICAS 35 CAs under 35 competition, Rimla won the Influence & Innovation category of the awards. The Entrepreneurship category, which recognised those who have the passion and drive to succeed in business, was won by Joel Watt CA, Founder of Jack Taylor and VISTEM. Joel set up his first business in partnership at just 24 years of age. Jack Taylor, a fishing trade company, today has an international customer base and a turnover of £5m per annum. In 2014, he founded VISTEM, makers of customised products and tools for heavy industry. He commented: "I think the 35 CAs under 35 competition has been great for promoting entrepreneurship. "We have a huge amount of people who are very smart but sometimes a little too scared to take that leap and start something. It's good to recognise those already doing it and hopefully encourage others as well." The Leadership category, rewarding the CAs who inspire and motivate others, was won by Colin McLellan CA, Finance Director at Skyscanner. Colin relocated to Tokyo earlier this year to fill the role of interim CEO of a joint venture between Skyscanner and Yahoo! Japan. He developed a team there for the improvement of product and drive growth and, during that time period, more than doubled monthly visitors and revenue. He said: "It has been a fierce competition; the calibre was really high and I came here with no expectations at all. "The process itself has been hugely insightful and I learned a lot from the judges, who were amazing. "I feel honoured to have been just nominated among this group, and to win is a huge source of pride." The Sustainability & CSR category, honouring those who display a high regard for social awareness and professional responsibility, was won by Thomas Gillan CA, CFO of Social Investment Scotland (SIS). Thomas impressed the judges with his passion and dedication to his work at SIS, who invest in businesses with a strong commitment to moral responsibility. He also recently set up SIS Community Capital, the UK's first mass participation social investment fund backed by social investment tax relief. He commented: "I do genuinely feel that CAs are very understated. Sharing a room with such an inspiring group of people and finding out what they do, what they're involved in and how they are driving better sustainable business is so rewarding. "The competition has been fantastic and it's been great to hear people being encouraged by this kind of validation to keep doing what they're doing." ICAS President Ken McHattie presented each category winner with a trophy and a Longines watch, generously provided by Brian Duffy CA and Watches of Switzerland. Two additional awards were announced during the ceremony, created due to the high calibre of entrants in the competition. The award for Global Influence, intended to reward a CA who is going above and beyond in promoting the CA profession on an international level, was presented to Mark Spiers CA. Mark travelled from Brazil, where he operates as CFO and Partner of Trocafone, to attend the awards. He moved to South America while working at Deutsche Bank to lead a major transformation of local accounting teams and processes. He said: "I think the 35 CAs under 35 competition has been amazing in recognising what everyone is doing and providing the opportunity for everyone to meet and network. "I am super excited to be here in London today, to meet the other candidates and to spread the word of the CA qualification." 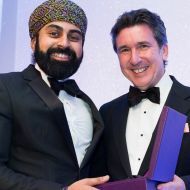 The Chief Executive award was given to Rachel Singh Davies CA, who particularly impressed ICAS CEO Anton Colella with her commitment to using her professional skills to further causes close to her heart. Rachel works with the Shell Foundation as CFO, an organisation she joined after turning down a corporate promotion to follow her passion. She said: "I think the competition has been fantastic to highlight the young CAs we have in ICAS and the changing demographic of the members as well. "To gain recognition among other CAs is amazing and I am thrilled with the award." The special award winners were each presented with a trophy and Apple Watch. Were you at the London CA Dinner & One Young CA Awards? Tell us in the comments below.